Ninth Circuit upholds ruling banning American flag. U.S. Supreme Court refuses to review ruling, letting it stand. Federal judges are well known for upholding free-speech rights. For example, a judge insisted that school officials allow boys to wear T-shirts labeled “Big Pecker.” Clearly, judges tend to uphold the First Amendment, even when the “speech” has nothing to do with politics and is arguably obscene. But the judges’ devotion to free expression has limits. Even the dedication of the ACLU to the First Amendment has exceptions. When it comes to expressing religious or patriotic sentiments, we’re on our own. Five students at Live Oak High School in Morgan Hill, California were threatened with suspension and sent home. Did they curse their teacher? Did they carry weapons? Did they wear their pants down around their knees? Did they wear T-shirts glorifying mass-murderer Ché Guevara? No, they wore T-shirts showing the American flag. But they did this on Cinco de Mayo, a Mexican holiday commemorating the Battle of Puebla, in which Mexicans defeated the invading French in 1862. And what did the ACLU, which defended students’ “right” to wear T-shirts proclaiming “big pecker,” say here? Nothing. A Latino − excuse me, Latina − student declared, “I think they should apologize ’cause it is a Mexican heritage day. We don’t deserve to be get disrespected like that. We wouldn’t do that on Fourth of July.” Her knowledge of her Mexican heritage does not include the fact that Cinco de Mayo is not Mexican Independence Day, which is September 16, not May 5. In fact, in Mexico, Cinco de Mayo is a minor holiday, unlike Mexican Independence Day. “Multiculturalism” does not mean actual knowledge of other cultures or languages − or even of one’s own. It means trashing American values. Later, about 200 Latino students walked out of class, waving Mexican flags and demanding “respect and unity.” Respect for what − narcissism and ingratitude? Unity with whom − people whose primary loyalty is to a foreign nation? The students acted as if they were not Mexican Americans, but Mexicans living in what is temporarily America. They were taught that immigrants need not adapt to their new nation, but the nation must adapt to them. This reverses the philosophy of the public schools, which for over a century successfully Americanized the children of immigrants. But no more. Now we are not Americanizing our own children, much less the children of immigrants. 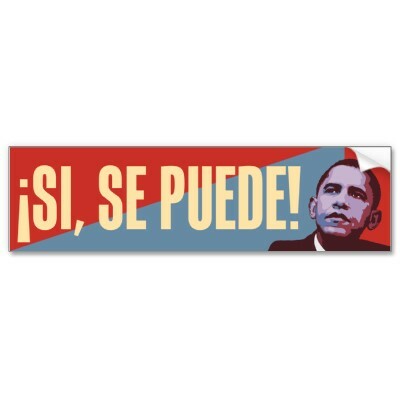 Demonstrators carried signs saying “SI SE PUEDE,” which they believed means “Yes we can.” But that would be “SÍ SE PUEDE,” with the accent over the “Í.” Without the accent, it means “If we can.” Perhaps they could if they were literate in at least one language. But with bilingual education, they often wind up being semi-literate in two. Administrators claimed the American-flag shirts were “incendiary.” Really? Who wanted to burn them? If wearing a representation of the American flag in America causes trouble, who should be disciplined − the wearers, or the troublemakers? Note that this was not the action of an isolated teacher or principal. It was the action of a whole school system, endorsed by a federal court. It betrays a systemic problem. If the school insisted on observing Cinco de Mayo, it could have allowed students to display both American and Mexican flags. You know, the way marchers on Saint Patrick’s Day carry both American and Irish flags. And the way marchers on Columbus Day carry both American and Italian flags. Isn’t the object to show that one can appreciate an ethnic heritage and still be a loyal American? Oh wait ‒ maybe that isn’t the object. 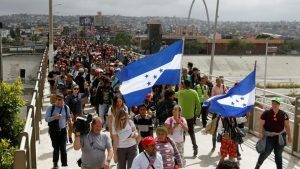 Maybe that’s why the thousands of would-be border crossers in Tijuana carry only Honduran flags. Maybe there is a lesson here. My mother’s family immigrated from Russia to escape persecution. I do not know what they were carrying when they arrived at Ellis Island. But one thing I know with absolute certainty: They were not carrying czarist flags. Real asylum seekers are not homesick. In an effort not to produce super-patriots, “educators” try to produce no patriots at all. We saw the danger of chauvinism in Nazism, and we see it now in radical Islam. But if one extreme is bad, this does not mean that the opposite extreme is good. Too much water can cause drowning, but lack of water can also be fatal. What if our enemies remain fanatically certain that their religion and their nation are the best, while we belittle our religion and scorn our homeland? Our enemies will grow stronger, while we become weaker. Raging chauvinists attack us and murder thousands, while we are upset by our flag on a T-shirt. Is that the way to ensure the survival of freedom? Homicidal fanatics crash airliners into office towers, while we are distressed by the mere mention of God at a graduation. Is that the way to guarantee the continuation of tolerance? Ethnic pride can be perfectly compatible with pride in America. Listen to “The Ballad of Mike Moran.” And look at the casualty lists from Iraq and Afghanistan − note all the Latino names. It depends on whether young people are brought up to be grateful for the opportunities they have been given, or to be narcissistic ingrates who always feel entitled to more. Some people view America as their homeland, to which they owe undivided loyalty. Other people view it as merely the place they happen to be living at the moment. But still others view America as a piñata, and they intend to keep hitting it as hard as they can, until either (a) they receive all the “free stuff” to which they imagine themselves entitled, or (b) the piñata is empty, whichever comes first. And judging by how things are going, (b) will come first. But that’s a problem. Many recent immigrants are not yearning to breathe free. Some want to impose Sharia law on all of us. Others define “free” not as a way to live, but as a way to get more stuff without paying for it. 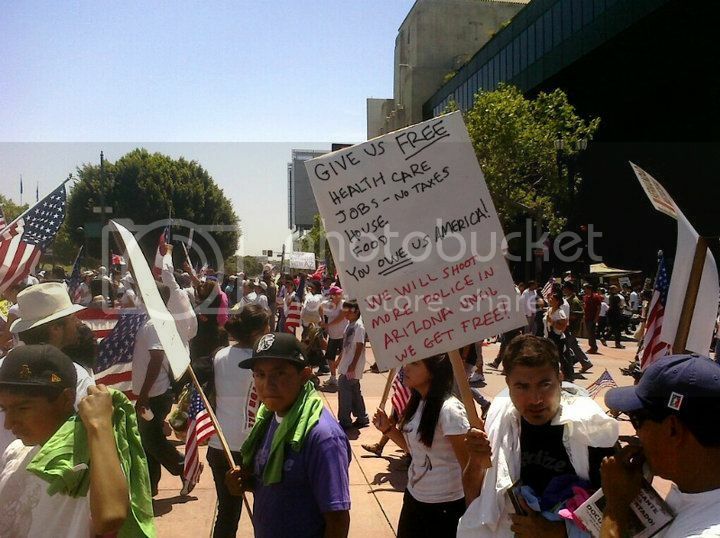 Read the placard: Give us free health care, jobs – no taxes, house, food, you owe us, America. Besides the childishly unreasonable demands and the threat to murder police, note that America is referred to as “you” as opposed to “us.” Now are you worried? Congratulations to the Morgan Hill School District, the federal judges, and the Supreme Court. You wanted to avoid trouble at the school, but all you accomplished was to cause more trouble than you could imagine. Like all your politically correct, multicultural, bilingual, job-destroying, anti-American, anti-Judeo-Christian friends, you tried to shove your left-wing agenda down Americans’ throats. But at long last, fed-up voters are pushing back. All you accomplished was to put Donald Trump in the Oval Office. Now deal with it.